« Slammed Society Chicago- Video Coverage! Hector and I met up yesterday for a quick shoot. 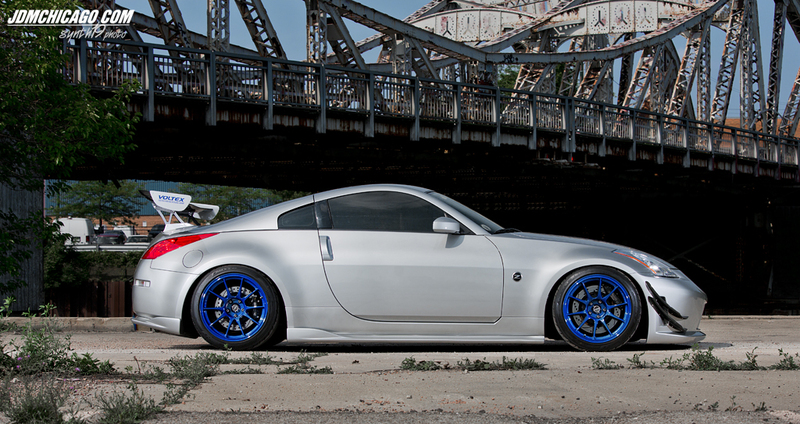 Hector was first introduced to the Z33 during the Chicago Auto Show in 2003. At the time he was driving a 2000 Dodge Durango R/T. As gas prices went up, Hector decided to trade the Durango in for something with better mileage which ended up being this 2004 Nissan 350Z Enthusiast edition you see here. 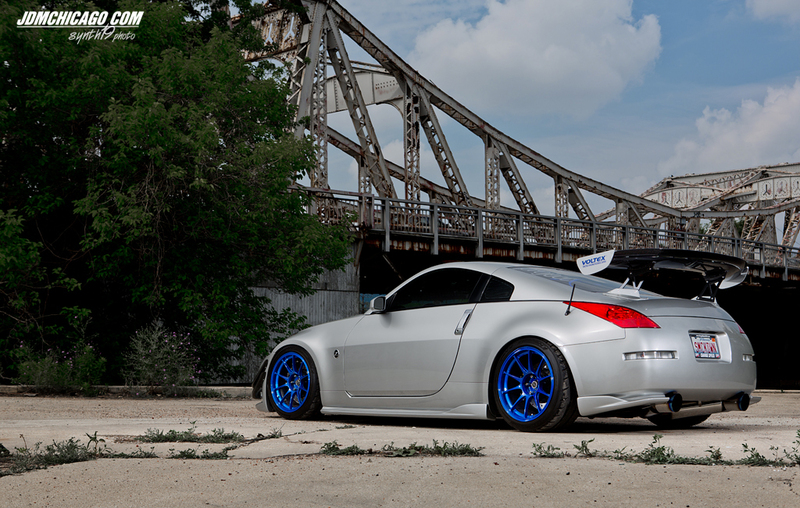 Because of work and travel, the Z stayed completely stock until 2009. In January 2009, Hector moved back to Chicago and was reunited with the Z. He had no idea what “modding” was or that a vast community of Z enthusiasts existed. At some point in the late summer of 2009, Hector decided to take that first step by purchasing a CAI. 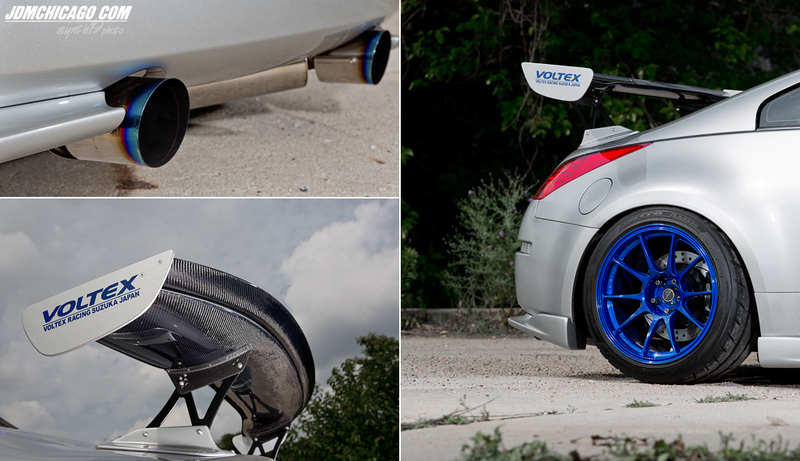 After a quick google search, he found several reviews for various 350Z intakes. 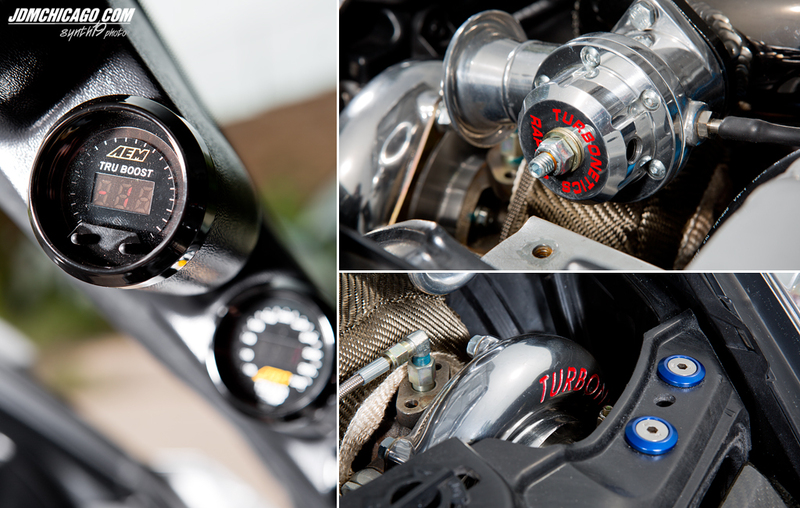 He eventually settled on a JWT Popcharger and carbon fiber intake tube. More importantly; his research led him to ChicagoZ.com, JDMChicago, and the very welcoming Chicago JDM enthusiast community. In October 2009 Hector found himself at the JDMC season closer meet at Fuddruckers. He was blown away once he arrived at the meet. After seeing some of the other cars there, he knew it would be a long and expensive winter. 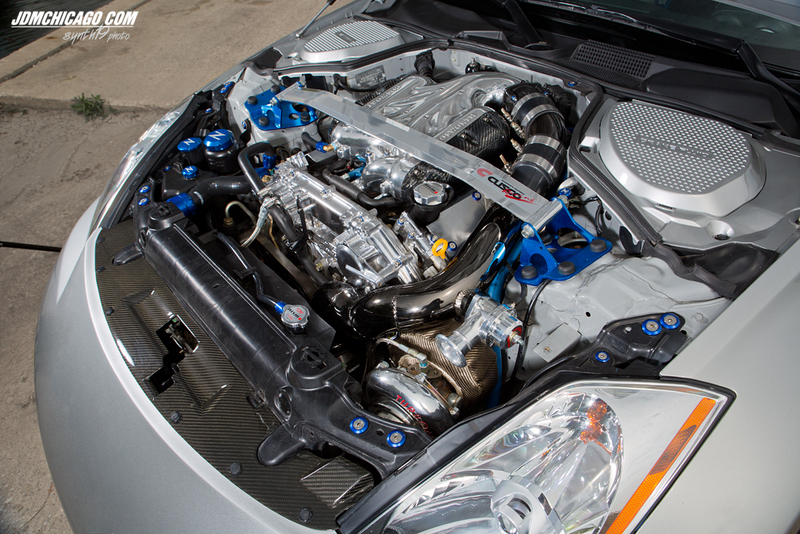 After installing the Popcharger intake, he added 19″ Volk GT-7’s, a plenum spacer, some engine dress up items. Additionally, the stock suspension was replaced with Tein S-tech springs and Tokico shocks/struts. During that winter/spring, Hector met Larry and Eli from Project X. They were a big help by sharing their knowledge and providing guidance on the various options that were available for his car. Although Hector barely knew what a CAI was several years ago, his 350z has slowly developed as one of my favorite z33’s in the community. As a previous owner of this particular platform, I am very familiar with the selection of parts and options. Hector did not take any shortcuts with his car. Many Z owners tend to mix and match aero that doesn’t always turn out right. 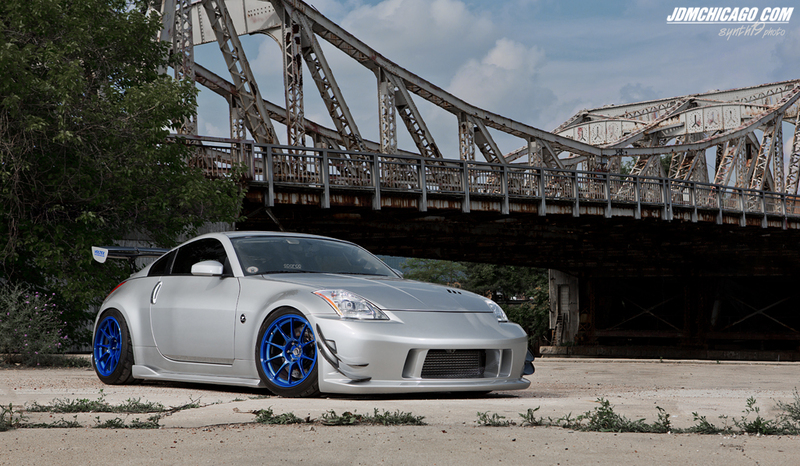 Hector went with a full Chargespeed kit that gives his z33 a very aggressive look, yet maintains the stock body lines. When Hector first mentioned partially painting his Voltex wing to me a few months ago; I was slightly on the fence with this idea. The final results turned but better then expected. Custom painted Weds Sport TC105N tie in nicely to the very subtle hue of blue on the oem silver paint. Take a look at this engine bay. I’m pretty sure Hector’s gas mileage is much worse than that trusty Durango he had back in 2004. haha. Although Hector has started to track his 350z over the last several years, it’s nice to see an owner still taking pride in the aesthetics. Thanks again for checking out this feature and stay tuned for Slammed Society Chicago coverage later on this week!